We’re interested in helping people to choose between different focus areas for helping the world. A complication is that people can have very different background assumptions, which makes it hard to give uniform recommendations. On the other hand, discussing the assumptions directly may not help if it’s unclear how they are decision-relevant. 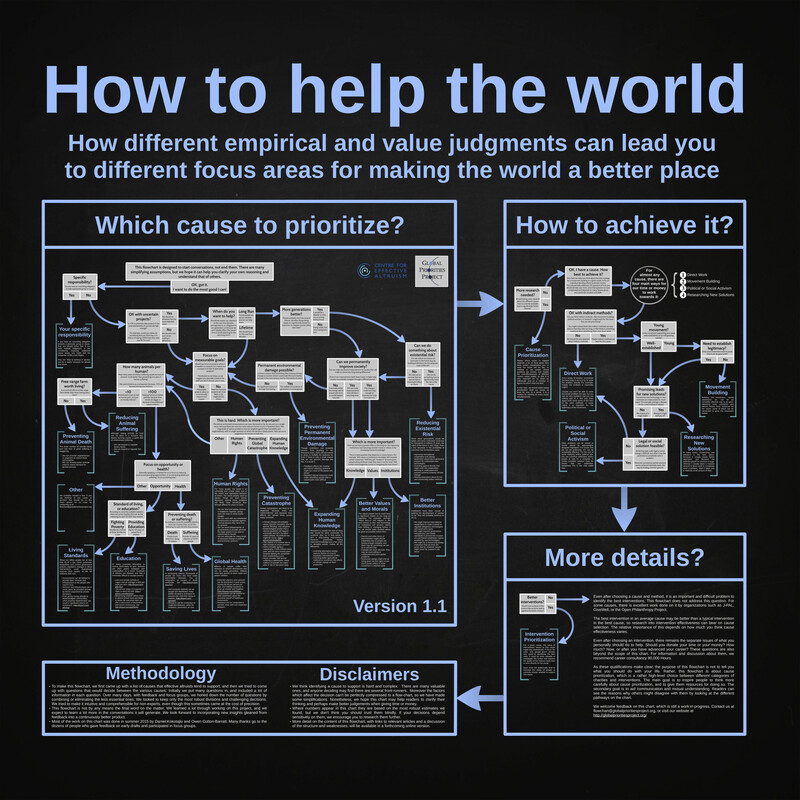 To address this, we’ve been working on a flowchart which maps out how different ethical and empirical assumptions can lead us to support different areas. We hope this can serve as a tool to help people clarify their own thinking, understand where others may be coming from, or identify which questions most need further thought. The flowchart can’t represent the full complexity of the question, and shouldn’t be followed blindly. It is mapping out how different answers to the question nodes will tend to lead to supporting different causes. The question nodes represent matters on which we think there may be a reasonable level of disagreement; we have tried to be neutral on these questions, although we may present the case for one side or another in future work. The chart is also not intended for individual career decisions – what you do with your own work will depend a great deal on your interests and skills, which the flowchart cannot capture. For that, we recommend 80,000 Hours. 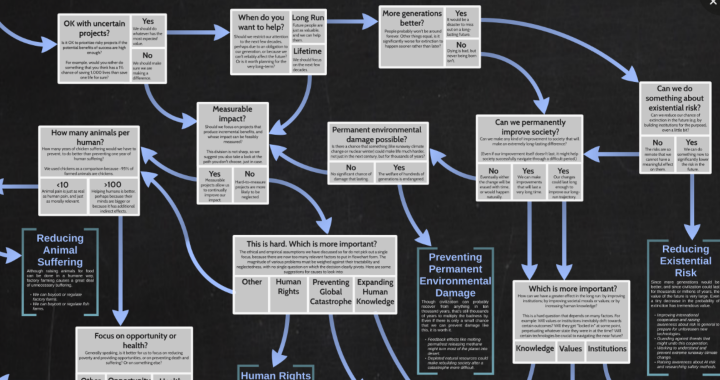 This isn’t a final version, and we are still actively looking for input and disagreements – you can send them to flowchart@prioritisation.org. In future versions we hope to make the chart easier to interact with, and allow readers to access more information for each node, as well as polishing the current recommendations. There’s an embedded Prezi version below, although you will need to be logged into a Prezi account to browse it properly. Alternatively you can find it as an image here (6MB), or a low resolution version here (1.5MB). If you want a high-resolution version for printing please contact us. Instructions for the Prezi version: Drag the screen to move around. Scroll wheel or arrow keys to zoom. Click on something to zoom to it. That looks amazing! Can you maybe export the Prezi as one large image? Flash keep crashing on me when I try to zoom in. Thank you. Thanks Denis, good idea. Now added. Nice, maybe I will use this in EA socials to question newcomers. I just think that numbers in “How many humans per animal?” are very misleading. That is a pity because IMO animal issues are already overlooked by most EAs. According to Animal Charity Evaluators, donation of $1000 to their top charity “would have impact equivalent to sparing about 14,000 animals from life in industrial agriculture”. These numbers may be inflated, but still. And note that it’s animals, not just chickens here. There is no way you could help 140-1400 people in a comparable way for $1000. What is more, according to http://vitalsigns.worldwatch.org/vs-trend/farm-animal-populations-continue-grow only 73% of livestock is chickens (not 95%) and other are mostly mammals, which people usually care for much more. If you’d at least changed 10 chickens to 80 chickens, 10 sheep, 5 cows, 5 pigs, it would be closer to reality. Saulius, thanks for the comment — we think this is an important question and want to get it right. Our numbers are certainly rough (which is why we present it as an order-of-magnitude matter), and also somewhat preliminary. But let me briefly explain the methodology. First note that we are comparing years of suffering, rather than numbers of individuals suffering. We think this is likely the most appropriate metric, but a more expanded flowchart could allow the user to choose. Since chickens have much shorter lives, this shifts the numbers. However I realise we’re being inconsistent as the 95% figure is counting by total lives, not counting by the number alive at any time, so thanks for flagging that. (i) We compared the direct cost of helping animals by purchasing welfare improvements to the direct cost of helping humans by purchasing welfare improvements. (ii) We compared the efficiency of persuading other people to make behaviour changes to help animals with the efficiency of persuading other people to make behaviour changes to help humans (here we compared the ACE estimates with estimates of the cost-effectiveness of Giving What We Can). In each case the estimate had some uncertainty, but both gave us ranges within the 10-100 region, which increased our confidence that this was a reasonable figure to use. I think that the numbers look wrong to you because you are thinking of comparing directly helping humans with indirectly helping animals, and not adjusting for lifespan. I agree that it’s not ideal to just present one kind of animal, but we are space-constrained in the current version of the chart, and it is much more expensive to make a difference to larger animals, so they look like they may be as expensive to help as humans. Ok, I did make a mistake not adjusting for lifespan, thank you for pointing that out 🙂 If you are comparing years of suffering, take a look at http://www.animalcharityevaluators.org/research/interventions/online-ads/online-ads-calculator/ You see, per $1000 spent 11,000 animals are spared from life in factory farms (roughly the same as effectiveness of ACE’s top charities) which translates to reduction in factory farmed years for non-fish by 3200 (or 2085, if I sum those years, not sure how they got 3200). There is still no intervention that for $1000 reduces human suffering comparable to 21 – 210 years in factory farm and 110 – 1100 slaughters. sorry, it had to be “11-110 slaugthers” to be in 10-100 range. For reducing human suffering, we thought the most comparable estimate to online veg*n ads (which are an indirect method about persuading others to change behaviour) was Giving What We Can (which helps in indirect methods which are about persuading others to change behaviour). In Giving What We Can’s last impact evaluation, their realistic estimate for impact is just over a 100:1 ratio for funds raised for top charities: https://www.givingwhatwecan.org/fundraising/#impact-calculations . So a $1,000 donation to them shifts around $100,000 in expectation to their top charities. This is enough to save around 20 infant lives and to additionally produce around 600 QALYs from people living in better health. This makes it look like the ratio might actually be smaller than the 10-100 we had suggested — but it will be adjusted a bit by the fact we were comparing just to chickens, and by the possibility that factory farmed years are rather worse than a single animal QALY each. So I do think the ratio looks broadly correct, and if it’s wrong I’m not sure which direction it’s wrong in. I would like to see more careful estimates of this (and we may produce some in the future). I didn’t know that GWWC is that effective and was impressed by their impact estimate. Thank you 🙂 However, I still think the current flowchart is still unfair to animal welfare because GWWC and other meta charities are not mentioned in the flowchart.  There should be a node about meta charities. I know there is one in “how to achieve it?”, but what you wrote means that “Which cause to prioritise?” is done under assumption that the answer to “OK with indirect methods?” is “no”. Because if it would be “yes”, than you would be comparing Mercy For Animals with AMF, not GWWC. Personally, I have never heard anyone saying that they are not OK with indirect methods (other than some abstract arguments against meta charities by people who give 50% of their donations to meta charities). And all methods are indirect in one way or another, IMO it’s an irrational distinction, we should only be looking at uncertainty, but I don’t want to expand on that here. Great flowchart; inefficient filesize! As the chart is just text + line-art, it could be efficiently losslessly compressed as one of the TIFF variants, maybe a PNG or even a GIF. I’m guessing it could be made 1/10th the size and resizable at the same time. b) then add GIS maps that show for each issue area, places around the world where the problem is most concentrated. c) then point to on-line communities where people are gathering on-line to talk about the map, the issues, what they can do, etc. I would expect there to be quite a few such platforms. Build a site that connects them all…and keeps adding new ones as they are formed. Wondering if there is there an elegant way to represent (and think about) the interrelationships? Perhaps differently coloured arrows linking each intervention to the others it may positively impact? Taking on health care, improvements there can reduce the financial burden of sickness, so reducing poverty and improving education attendance.